Want to give your dog some extra TLC during their stay with us? Try one of our add-ons to give your dog some extra pampering while you’re away. Stuffed Kong ($5/treat) – Delight your pup’s taste buds with a treat-filled Kong! We will stuff a chewable Kong with peanut butter or wet food and freeze it so your dog can enjoy this special treat for hours. K-9 Ice Cream ($5/treat) – Does your dog love frozen treats? Purchase a Frosty Paws for your dog to enjoy on a hot day or any time of the year! Playtime With Friends ($10/session) – Your dog will enjoy 30 minutes of extra outdoor playtime with other social dogs so they can sniff, play, and run together. All Playtime With Friends is supervised by a knowledgeable dog handler. 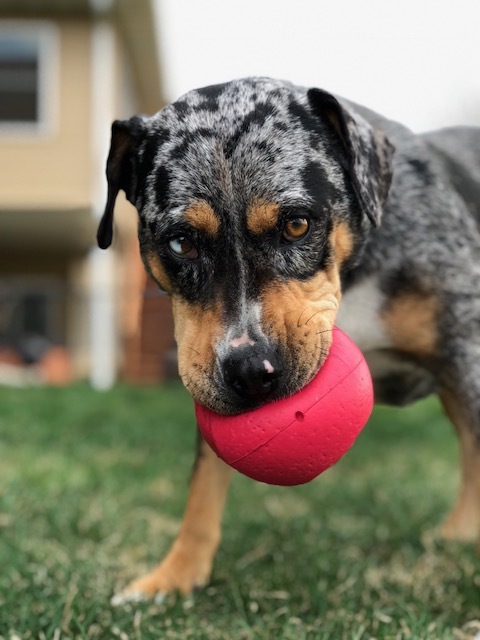 Fetch ($10/session) – Does your dog love fetch? We will spend 20 minutes playing fetch with your pup so they can burn off some extra energy. We will have a variety of balls, Frisbees, and other fun toys for your dog to choose from. Daily fetch time will guarantee you will come back to a happy and tired dog! One-on-One Playtime ($10/session) – If your dog likes to play without other furry friends around, give them some one-on-one playtime with us! We will take your dog out of their kennel to get some one-on-one time with us; whether that’s playing outside or just hanging out with us in the office, your dog will appreciate some extra attention and love!